Got a delicious tongue twister for ya! 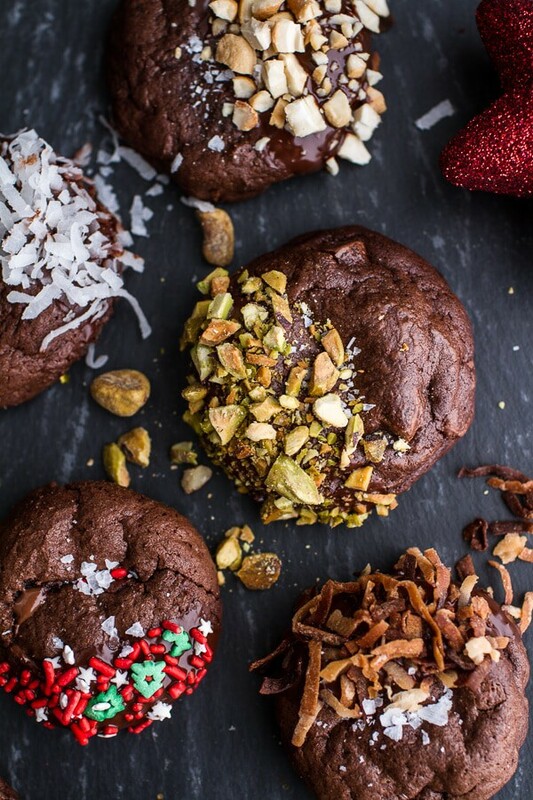 Triple Chocolate Truffle Cheesecake Cookies. It’s actually only a tongue twister if you try saying if five times fast, but you know I love my wordy titles. SO. I am just going to make this short and sweet for you today, because I really think you should just drop whatever you are doing at the moment and start making these cookies. Like if you haven’t left for work yet, go make the dough now so it can sit in the fridge and you can then eat warm cookies when you return home tonight. Yes, yes, yes. <–Do it. 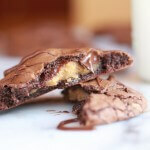 Your Tuesday will be made if you make these. MADE. Originally, I was thinking these would be awesome cookies to give as gifts, but then we all tried them and realized there was no way that any sane person could actually NOT eat all of these before wrapping them up. I mean, warm? Right out of the oven? With a cold glass of milk?? Irresistible. And seriously, if you are hoping for something pretty big from Santa this year, I would put these out on Christmas Eve. They’ll surely get you what you want. Here is a fair warning for these cookies though – DANGEROUS WHEN WARM. If you love chocolate, you will not be able to stop at just one cookie. Especially if they are warm, so dangerous when warm. These are that cookie that when you take a bite, your eyes roll back and your voice says, “Mmm” without even realizing you made a noise. 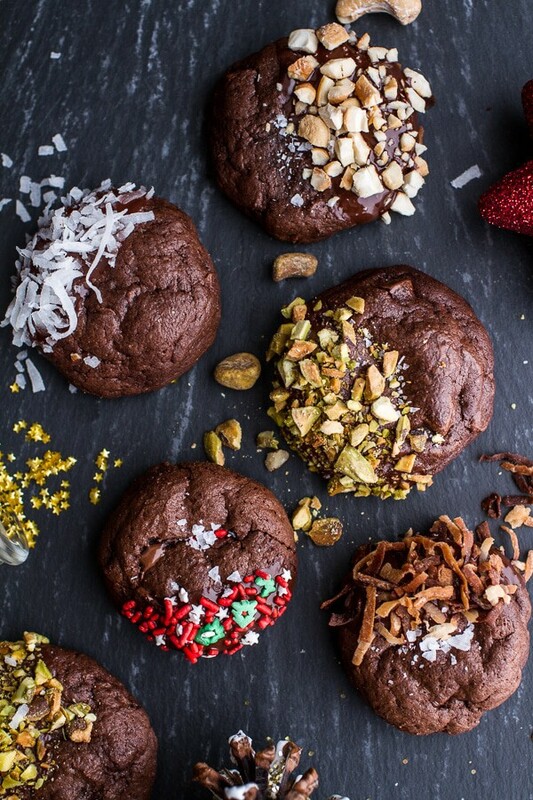 These cookies are like a truffle, but better. 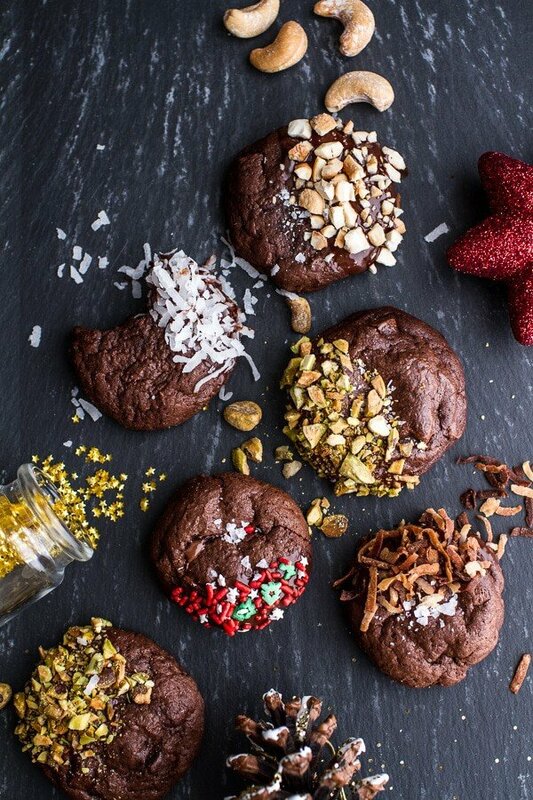 No joke, really truffles have nothing on these cookies. They’re soft, and crazy fudgy, thanks to the cream cheese. So you see, gifting them might be kind of hard to do. BUT if you can somehow find a way not to eat them all yourself, they’d make a pretty great gift. This is a pretty simple cookie to make. Of course it involves a boat load of chocolate. Clearly. Some eggs, some butter, some vanilla and umm maybe just a little Kahlua because it is December, and that’s just how I roll. The only little bummer is if you want these cookies NOW, you can’t actually have them for like two hours because they need time to hang out in the fridge and get cozy with the eggnog (or in my case the milk because I am not really an eggnog person). The good news is, you can make double or even triple batches of the dough and just keep them in the fridge all the way up until Christmas. 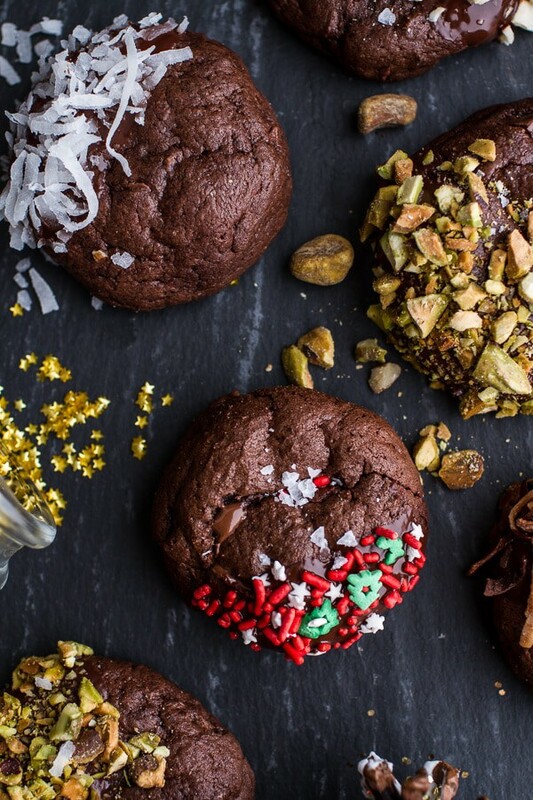 That way, you can have chocolate truffle cookies at a moment’s notice. Think surprise guests, hungry boys – oh, and these are perfect for those times when you just need some serious chocolate. We all know it happens, so why not be prepared! 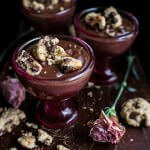 Tripple Chocolate Truffle Cheesecake Cookies. In a microwave safe bowl or glass measuring cup, melt together the butter, bittersweet chocolate and dark chocolate. Microwave for 30 second increments, stirring until totally melted. Set aside and let cool completely. You can also do this over a double broiler. In the bowl of your electric mixer, add sugar and eggs, beating on high until light and fluffy, about 2 minutes. Add in vanilla extract, Kahlua, cream cheese and melted chocolate/butter, beating for another 1-2 minutes until combined. Scrape down the sides of the bowl and make sure everything is combined. Now stir in the dry ingredients with a large spatula until fully mixed. Fold in chopped milk chocolate. Cover with plastic wrap and place in the fridge for at least 45 minutes or overnight. Preheat oven to 350 degrees F. Place parchment paper (or a silpat) on an un-greased baking sheet. Remove the truffle cookie dough from the freezer. 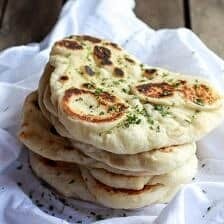 Grease your hands with a little canola oil (cooking spray works really well, but water can also be used) then begin to scoop out about 2 teaspoons of dough placing them about 2 inches apart. Using your oiled (or wet hand) flatten the dough into a small round disk. Repeat with remaining dough. Do this quickly and if you are doing the cookies in batches, refrigerate the dough in between rounds. Bake for 9-10 minutes. Let cool for about 5 minutes on the baking sheet. 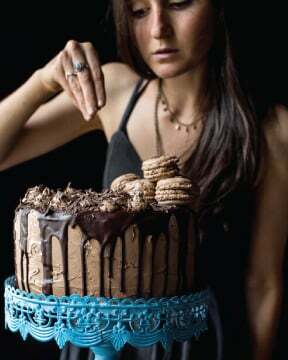 Once cool enough to handle, dip in melted dark chocolate and then sprinkle with desired topping. Eat warm or let cool and store in an airtight container for up to four days. 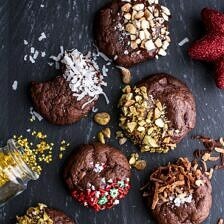 *Adapted from [All Recipes | http://allrecipes.com/recipe/chocolate-truffle-cookies/]. So let’s go make cookies! I can totally see why you devoured these cookies! They’re gorgeous! Oh my if I made these when my husband was home he would go into a chocolate coma from over eating. HAHAHA!!! We are so into eating warm cookies any time I make them. Warm is best!!! 3 eggs with just 3/4 cup of flour is sure different. The low amount of flour and the 3 eggs makes these super rich. 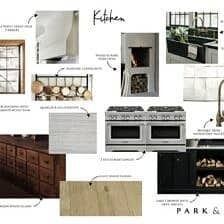 This makes me not want to go to work today and make the dough now. They are so pretty too! Oh. My. Word. Ok, so I would totally make these but I have no cream cheese and we are in the middle of a Nor’easter here! I love the Christmas tree sprinkles! Pinning !! But stay in school…it’s always the smart way to go! 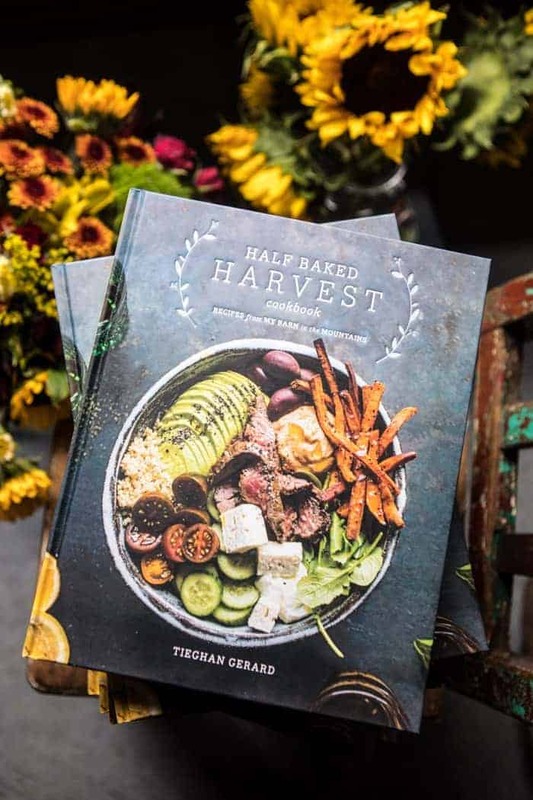 Every time I think I know which recipe of yours I am bringing to our holiday party this year, you top it with something even better! What percent cacao are you using for ‘dark’ chocolate? Some use the term interchangeably with semi sweet – others darker. Thanks. I use Hersey’s special dark. It does not say the percentage on the box, sorry! Thanks. That’s good stuff. Internet says it’s 45%. Can’t wait to try these! I can only imagine how amazing these taste when they’re warm! Love all the different toppings on these! These cookies – swooooon! I want to eat ALL OF THEM! Ahhh the words cookie and truffle just collided!! I can only imagine how amazing these cookies are. Definitely going to NEED to make these for xmas. All I can think about these cookies is: COME. TO. MAMA. 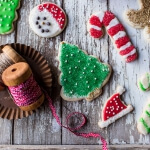 These cookies are gorgeous and look very delicious! Stunning pictures as always! I can totally see myself finishing them all when they’re freshly baked. It must taste amazing and look so beautiful. That’s it. 1. I’m buying Kahlua tomorrow and 2. I’m putting cream cheese in cookies. These are amazing! These look amazing! Leave it up to you to make cookies look like the best dessert on earth Tieghan!! I can’t wait to try! 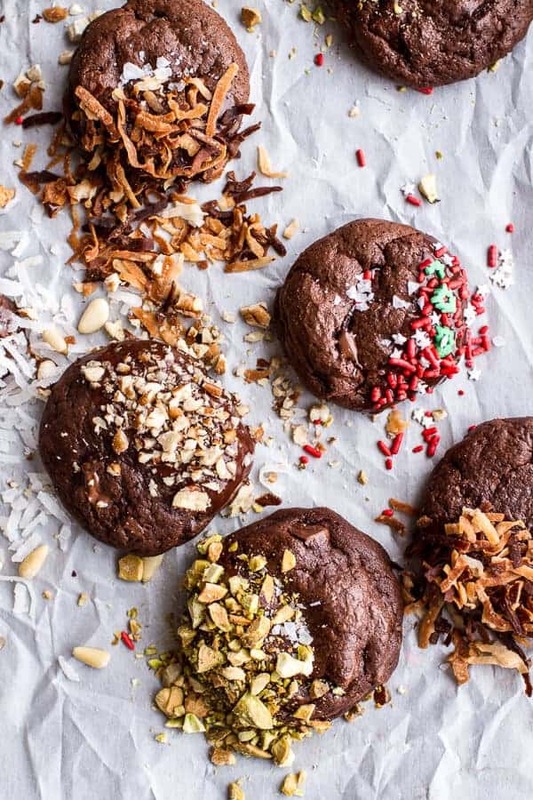 My Tuesday could use a serious dose of chocolate and these cookies are just what I’m craving – love!! These are pretty, which matters since we eat with our eyes first, but they sound like an absolute feast for the taste buds as well. I wouldn’t mind carb-o-loading for a race I’ll never run on these. 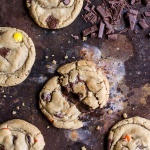 The thickness and richness of this cookie is driving me bonkers … YUUUMM!!! Thanks so much for all the kind words, Hannah! Where is my glass of milk or cup of hot coffee. Gad this features chocolate in a wonderful form. Made a batch of these yesterday and they were devoured before I even got to dip them. Making a double batch tomorrow for Christmas. These are my new favorite cookie. Decadent!! YA!! So excited you love these, thank you! 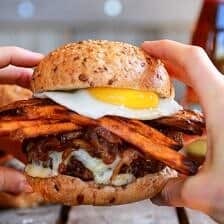 I have all the ingredients to make these today! They look delicious! How long can I freeze the dough? I wouldnt freeze it long than an hour unless you want to freeze them for a long period of time. Then just thaw on the counter an hour or so before baking. Enjoy! WHATEVEN. Amazing!!!! The sprinkles really make them look oh so fancy and delicious. This might be the best thing I’ve ever seen!! I want to make them and share them with NO ONE! I made a batch and they turned out like cakes rather then cookies! Any idea where I’ve gone wrong or are they meant to have a soft texture? Hey Abby, they are meant to have a soft texture, but they should not taste cake like. Did you like the taste? I made the dough and left it in the freezer for an hour but when I took it out it was rock solid :/ any suggestions as to how I should refrigerate it next time? Also! Is there anyway to re-warm the cookies after they’ve been sitting air-tight in the fridge or should I just eat them cold? So excited to fill my tummy tonight!!! I’ve left the dough out for a couple hours now and it’s still as hard as it was before…any ideas as to why/how I can salvage my non-existent cookies?? The dough just gets hard, I am not sure there is a way around it. You can re-warm the cookies in the microwave for 10-20 seconds, that works great! Enjoy and thanks again! Hi ! If I’m baking these tomorrow, do I put the dough in the fridge or freezer? The recipe says to place it in the fridge to chill, and then it says to remove it from the freezer? Thanks! Can’t wait to share them at my cookie party !! Hey Melinda! Sorry about that, in the fridge, not the freezer. hope these are hit! Thank you for your quick reply!!!! Hi! 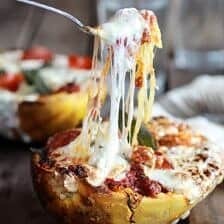 Just saw this recipe and I was interested in making them for Christmas. 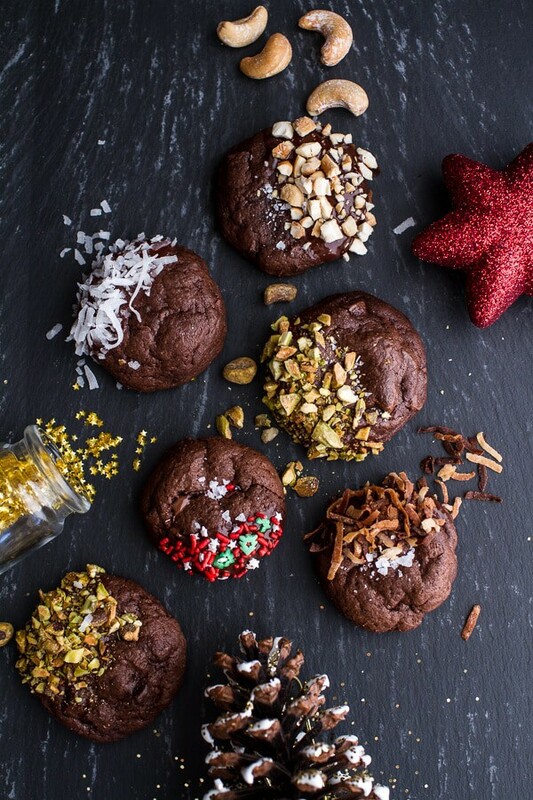 Can you make the cookies (not just the dough) ahead of time and freeze them for Christmas? Hey Becky! Yes, you can bake and freeze the cookies, though I fine the best if you freeze the dough and then bake. PLease let me know if you have any other questions. Thank you! I doubled the recipe for these (funny story there- I accidentally started off with double the amount of chocolate melting, so I figured I might as well double the whole thing!) and I think they turned out pretty well. I changed up the times that I was baking the cookies; my first batch was in the oven for 9 minutes and ended up pretty gross and dry, so I did 7 minutes for my second batch and they were perfect. I decorated with a glaze and lots of sprinkles. Anyway, they were a big hit!!! Thank you so, so much for this delicious, creative recipe!!! Oh jeez! Well i’m so happy it worked out!! Thanks so much for making them! So happy you liked them! It’s the whole egg. The egg just needs to have bubbles on top and be pale yellow. Hope you love these and Merry Christmas!